In this article, I’m going to include the top 10 largest cryptocurrencies based on their market cap. However, I will also provide the websites where you can check the full list of coins below. 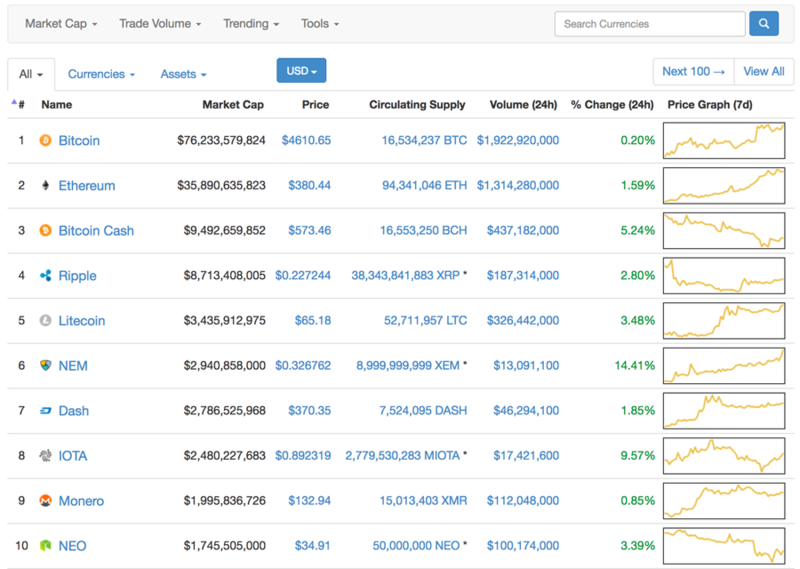 At the time of writing (30 Aug 2017), these cryptocurrency assets below have the highest market capitalization. Also included are their definition based on how they market themselves as. Bitcoin (BTC) – Bitcoin is the first blockchain experiment created by Satoshi Nakamoto (a pseudonym for an unknown person, or group of people). Bitcoin is an innovative payment network and a new kind of money. It uses peer-to-peer technology to operate with no central authority or banks. Ethereum (ETH) – Ethereum is a decentralized platform that runs smart contracts: applications that run exactly as programmed without any possibility of downtime, censorship, fraud or third party interference. Bitcoin Cash (BCH / BCC) – Bitcoin Cash is a peer-to-peer electronic cash, a hard-forked version (a branch) of Bitcoin. Ripple (XRP) – Ripple is an enterprise blockchain solution for global payments. Litecoin (LTC) – Litecoin is a global decentralized currency based on blockchain technology, essentially a lighter and faster version of Bitcoin. Dash (DASH) – Dash is digital cash to make instant and private payments online or in-store using a secure open-source platform, hosted by thousands of users around the world. NEM (XEM) – NEM is a smart asset blockchain built for performance. IOTA (MIOTA) – IOTA is built as a backbone of the Internet of Things, and will also make every technological resource between business-to-business a potential service to be traded on an open market in real time, with no fees. Monero (XMR) – Monero is a secure, private, and untraceable currency. It is open-source and freely available to all. NEO (NEO) – NEO, formerly Antshares, is China's first ever open source blockchain – also dubbed as smart economy that will include digital asset, digital identity and smart contract.